Select the song in either the Library’s Music category or a playlist. Press cmd+I or choose File→Get Info. Edit the song’s information under the Info tab. Keep in mind that the more work you put into setting the information of the songs in your Library, the easier it is to browse and use iTunes. Incomplete song information can make it more difficult to find your songs in a hurry. If you prefer, you don’t have to set all the information about a song. Normally, you can get away with setting only a song’s title, artist, and genre. The more information you put in, however, the faster you can locate songs and the easier they are to arrange. iTunes tries to help by automatically retrieving known song information, but sometimes you have to roll up your sleeves and do a little work. Select the desired songs from the track list. You can set iTunes to automatically attempt the addition of album artwork every time you rip tracks from an audio CD or when you add songs without artwork to your Music Library. Click iTunes and choose Preferences; then click the Store button and select the Automatically Download Missing Album Artwork check box to enable it. Want to manually add album covers to your song info? If you select just one song in the track list, you can display the Info dialog and then click the Artwork tab. 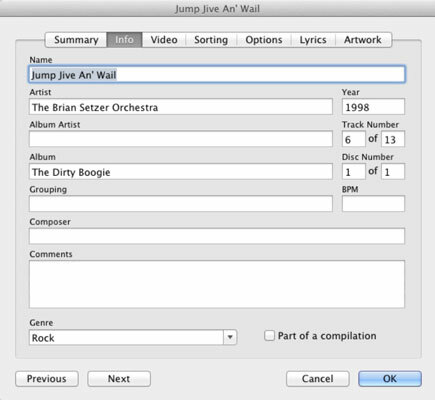 If you select multiple songs from the same album, first display the Info dialog. Now launch Safari, visit Amazon.com, and do a search on the same album (or search an online artwork library, such as AllCDCovers.com). Drag the cover image from the web page right into the Info dialog, and drop it on top of the “sunken square” artwork image well. When you click OK, the image appears in the Summary pane, and you can display it while your music is playing by pressing cmd+G or by clicking the Show or Hide Song Artwork button at the lower left of the iTunes window. By the way, if you buy tracks or an album from the iTunes Store, Apple always automatically includes album covers.